﻿ Sports - Cloneen N.S. Sport plays a huge role in Cloneen N.S. and this year was no exception. This emphasis on sport is reflected in the many activities undertaken throughout the year. – Irish Dancing (Term 1), Swimming (Term 2), Tennis (Term 3) combined with the ongoing activities such as Football, Ladies football, Camogie, Hurling, Athletics, Boys and Girls soccer teams and Spike ball this term. Cloneen NS and the local GAA club work well together for the one goal – the nourishment, enjoyment and promotion of GAA in our community. To this end Jerry Kelly, assisted by Sadhbh Leamy lead the Gaelic Football, hurling and camogie in our school, with training scheduled every Monday in the GAA pitch. 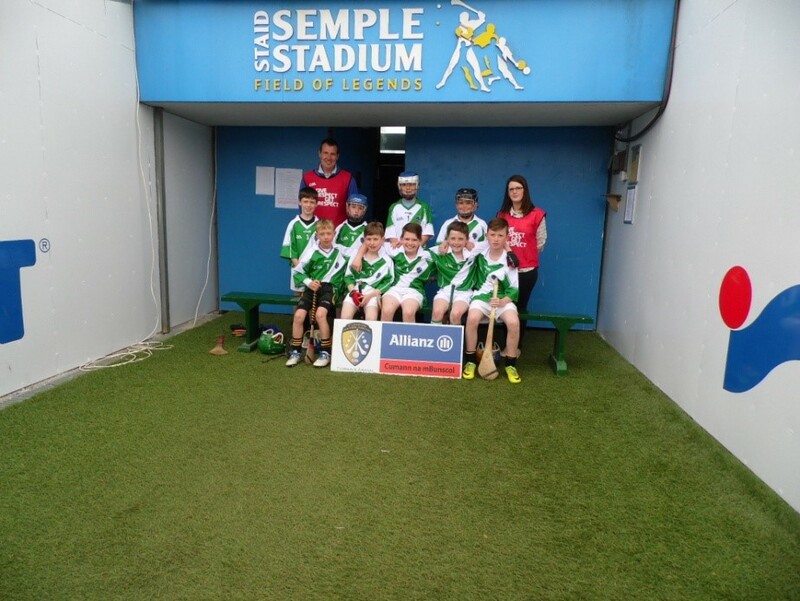 For the past few years, teams from Cloneen NS reached the finals in Semple Stadium – no mean feat! As well as that we have had several children chosen to play for their county in Cumann na mBunscoil. 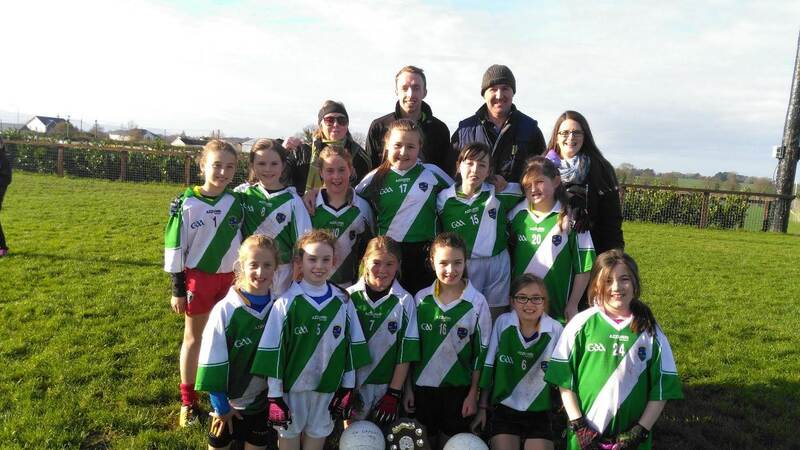 This year has been a very successful one for the school, with all teams doing themselves proud, but the team that stood out is the U/11 girls team who had a comprehensive win over Ballyporeen in the County Final. A trainer comes to the school every Friday throughout the school year. 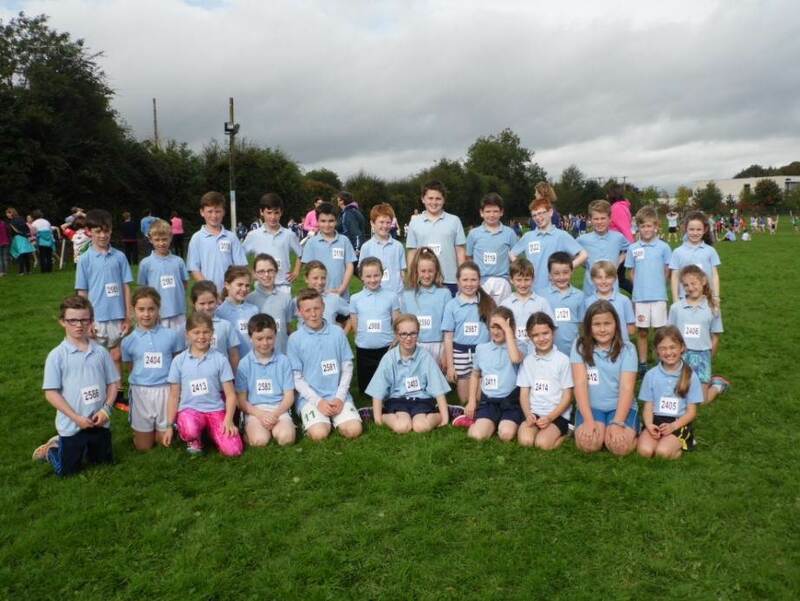 Well done to 3rd and 4th class boys and girls who came First and Second in their team event in Thurles. Congratulations also to Verona Madigan, Daithi Hogan, Tom Ryan. Eoin Morrissey, Michael Cuddihy, Charlie Noonan and Meah Cuddihy who also received medals on the day. Both the boys’ and the girls’ teams took part in a county blitz in Cahir and both reached the final stages of this competition. As the girls are only in 4th class presently, they will have a great chance over the next couple of years to win the title! For the last term every year, the school choses a different activity for the children to enjoy. The last choice was tennis, under the guidance of the esteemed trainer/coach and former international player – William Guiry. William brought all his own equipment and the dept of knowledge he brought to the coaching was second to none. All the children who took part enjoyed the exposure to tennis thoroughly. We have two exceptional young players – Finn and Verona Madigan and we wish them every success in their future careers. Golf was another 3rd term activity that the children had the opportunity to experience. This was immensely successful with an excellent golf coach to taught the children the fundamentals of the sport and consequently providing them with a foundation that will stand to them in the future. Rugby was the first of the many activities which the school focused on for our term 3 activity. The children experienced the basic rules of rugby, the etiquette behind the game and enjoyed many good natured games of tag rugby. 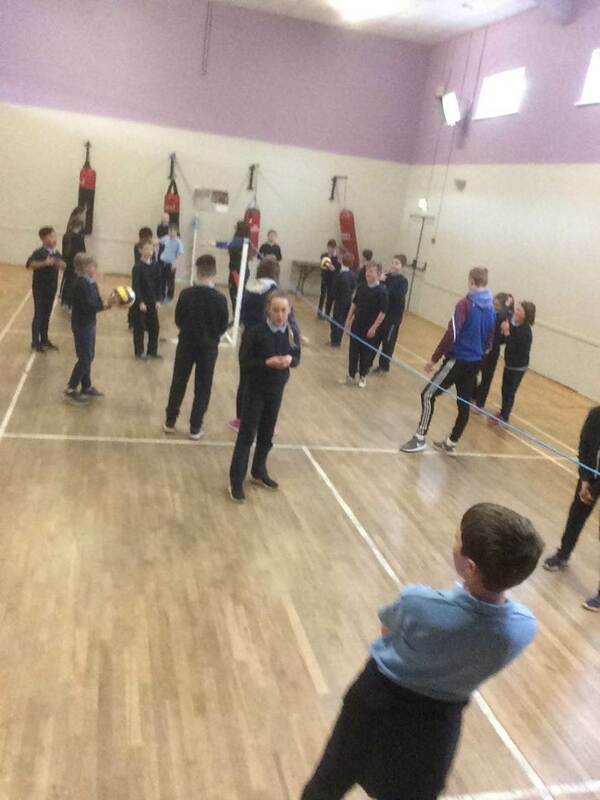 5th and 6th Class participated in the Transition Year Spikeball Leaders Programme co-ordinated by Presentation Secondary School Ballingarry. They enjoyed learning this new sport and were excited about playing against other local primary schools participating in the programme. 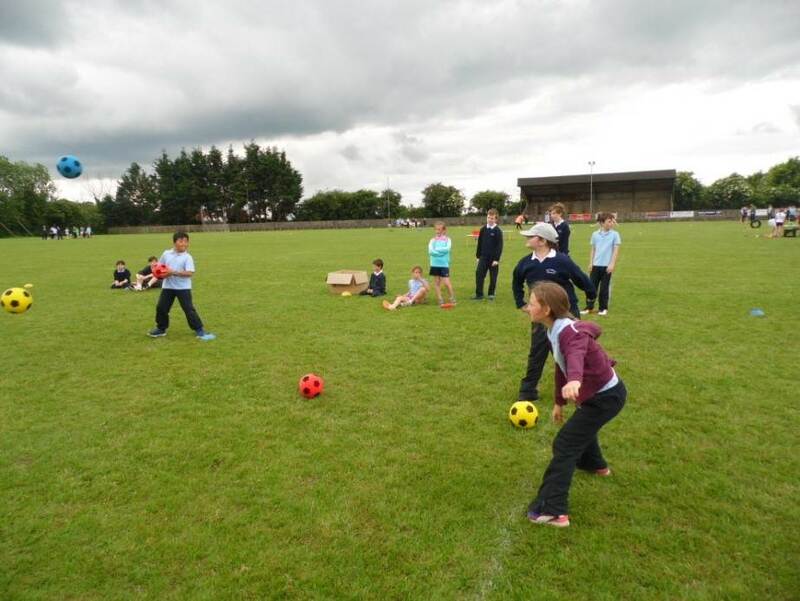 Every Jun the children of Cloneen and Kilvemnon join together for sports day and we alternate the venues – either in Cloneen GAA field or in Kilvemnon school. It is a fun day for everybody. Many thanks to the parents who made some delicious ‘nibbles’ for all to enjoy and a special thanks to Fethard Scout Group for the use of their marquee and boiler when the Sports Day is held in Cloneen. Thanks also to the past pupils who help make the day such a success. 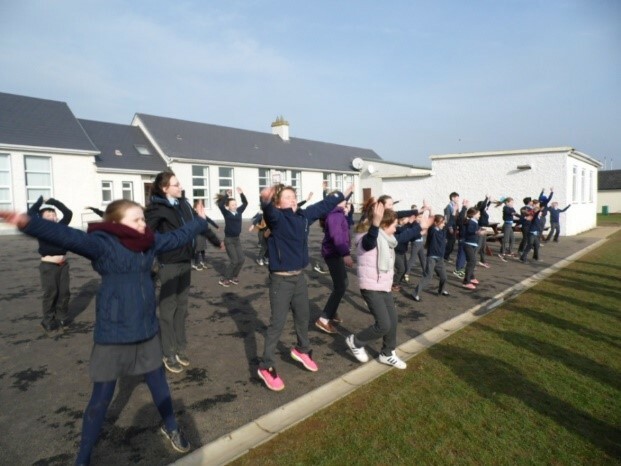 This year Cloneen N.S took part in the nationwide Ten at Ten in an effort to highlight the benefits of regular activity. We stretched and danced our way for ten minutes led by our motivated sixth class boys and girls. The children continued with their lessons in Irish Dancing again this year. Josephine Kenny has been teaching all the pupils of the school for many years and is very popular amongst her pupils. They learn such dances as the Siege of Ennis, The Walls of Limerick and some interesting sets. We thank Josephine for her enthusiasm and dedication to our school.